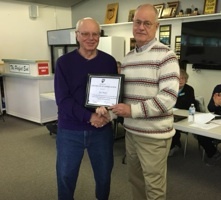 It is with great pleasure that Bowls BC has presented the Certificate of Appreciation to Jim Muir. This is given to him for his dedication and service to our sport in Province as the role of Umpire for Bowls British Columbia. Jim is a member of the Parksville Lawn Bowling Club of North Island District. Along with countless hours in his District, Jim has also dedicated time down South, as he has officiated in the State of Arizona during the winter months throughout the past few years. Congratulations Jim and thank you for all the hours of volunteer work you have dedicated to our Province over the years. We look forward to seeing you out on the greens this year.